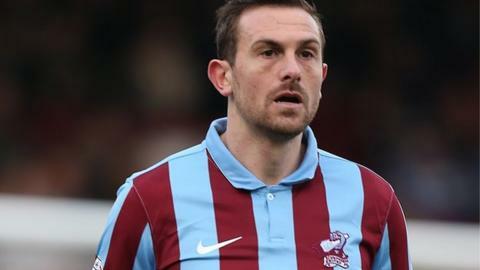 Scunthorpe United have released eight players after winning automatic promotion to League One. Striker Paul Hayes, 30, joined the club for a third time in December and scored four goals in 16 games. Midfielder Michael Collins, 28, spent the last four seasons at Glanford Park, making 89 appearances. Defender Christian Ribeiro, 24, midfielders Etienne Esajas, 29, and Andy Welsh, 30, and striker Connor Jennings, 22, have also left the club. And youngsters Jamie Wootton and George Grayson have been told they will not be receiving new contracts. The club have offered new deals to Sean McAllister, David Mirfin, Niall Canavan, Deon Burton, Terry Hawkridge, Gary McSheffrey, Eddie Nolan, Andy Dawson, James Severn, Luke Waterfall, Matt Godden, Callum Howe and Curtis Bateson. Midfielder McAllister, 26, made 39 league appearances after joining in the summer after a short spell with Scottish side Cowdenbeath. Veteran striker Burton, 37, scored six goals in 33 appearances while full-back Dawson, 35, was reduced to just 22 appearances because of injury, but both have been offered new deals along with former Coventry winger McSheffrey, 31, who made 13 appearances after joining in January.